Adriaen van der Donck: A Dutch Rebel in Seventeenth-Century America is the first book by J. van den Hout, an independent scholar. It is published by Excelsiior Editions, an imprint of the State University of New York Press. I have taught history for over 35 years, so I know how the teaching process goes. Huge swathes of historical events, often covering decades, have to be summarized, characterized, and finalized in a short time. Even if one were teaching a more specialized course, it is still the same. A class on World War II will most likely skip the Aleutian Campaign which reclaimed the only U. S. soil that the Japanese captured. Unless one is using Thomas Cutrer’s fascinating book Theater of a Separate War, the Trans-Mississippi portions of the American Civil War will get only a glance. Colonial American history is a wide world of experiences, time, personalities, and events. I know this because I took both under graduate and graduate level courses on colonial history (and loved them both). Try as I might to get through the colonial period in my classes, I usually get or risk getting bogged down in Puritans of New England, the Great Awakening, or the French and Indian War. Even with my propensity to get lost in the 13 to 21 English colonies, I really give short shrift to Spanish, French, Swedish, Portuguese, and Dutch colonizing. (Russian colonies on the west coast don’t even get a glance.) The history of the colony of New York always includes a bit of the background relating to it originally being the New Netherlands and New York City being New Amsterdam. For trivial pursuit sake, I mention that Wall Street was an original fortification by the Dutch. Later, in literature, the Dutch show up again with the writings of Washington Irving. The one name that our American history texts usually include for the Dutch settlements is Peter Stuyvesant. No doubt Stuyvesant was a powerful and influential colonial leader, comparable to such men as William Bradford and John Smith. In the typical history class fly-over, Peter Stuyvesant and New Netherland colony are synonymous. But history is always far more complicated, complex, interwoven, and intricate than our breezy lectures imply. Hence the importance and interest in this biography of Adriaen van der Donck. Early in life, he emigrated to New Netherland and was successful as a farmer, colonizer, and government official. Like most of the Dutch from his time and place, he was a member of the Dutch Reformed Church. His wife, however, was an English woman. Colonial life was as prone to controversy, political strife, and differing opinions as life in our times. Van der Donck found himself at odds with some of his political peers and superiors on several occasions. Rather than being one who would “go along and get along,” he was, as the subtitle notes, a rebel. Ultimately, his conflicts took him back to Netherlands where he made appeals regarding conflicts that he has with Stuyvesant. This did not go well for him and resulted in him being detained for a longer period from his farm and family in the New World. The delay gave him time to make one of his more notable contributions to American colonial history. He wrote a work about the colony the Dutch had claimed. 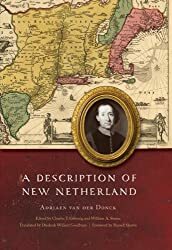 Titled A Description of New Netherland (in English translation), this remains the best and most extensive description and discussion of the Dutch colony. Or we should say, the short-lived Dutch colony. The English, whose possessions surrounded New Netherlands, forced the colony to surrender to the crown, so New Netherland became New York. Van der Donck himself, after his delayed return to his home, Although he was both sympathetic and understanding of the Native Americans in the area, he was apparently killed during an uprising. There are a few places in New York where bits and pieces of his name and legacy remain. The city of Yonkers is part of his original land grant. A down town plaza along the Saw Mill River has been named Van der Donck Park. His book on New Netherlands, which contains his vision for what the area could become, is available and in print. One expects that a book of this sort will mainly be read by upper level and graduate level history students in college courses focusing on colonial America or on Dutch immigration. That’s fine, but I hope a few others stumble across this book. It is a fascinating story about a skilled man mostly unheard of who made a contribution to what became New York and the United States. Post Script: One of the benefits of reading biographies is the anecdotes that shed light on times past. Van den Hout, the author, tells about a conflict between a man named Kieft who had a feud with one of the ministers. She writes, “In his long-running feud with the Reverend Bogardus, he was reduced to attempting to disturb the church services by whatever means possible. He, along with those who did not dare cross him, went so far as childishly interrupting the sermons with stomping, singing, dancing, even resorting to drum rolls and cannon fire” (page 70). Having labored for years as a pastor, I am thankful to have not had any similar experiences.